Begonias are beautiful flowering plants but they do require some care and they can be fussy about the kind of care they receive. Learning the secrets of proper begonia care can provide you with years of enjoyment from these beautiful plants. Keep the begonia mostly in indirect light as too much sun can burn the leaves and give the plant an unhealthy appearance. Choose a window under the eaves of your house or one that is partially shaded by a curtain or a tree. If you have a hook screwed into your ceiling, that would be the perfect way to display your plant as begonias quite often have trailers that hang down. Partial sunlight really is best for these plants so choose carefully when picking a window. Make sure the soil is kept moist at all times. Begonias don’t like to get dry, nor do they like to be too wet. You can tell a dry begonia because its leaves will be dried up and crisp, while a begonia that is too wet will turn mushy and limp on its stems. Catch these symptoms early enough and they are fully reversible. Spritzing the leaves every day during the dry winter months helps to keep the plant healthy as well, because begonias prefer high humidity. Begonias require periodic feeding, so make sure you have on hand a package of plant food sticks. The back of the package should tell you how many to use, but always remember that the size of the plant determines the amount of food to give. This is usually gauged by the size of the pot itself. Neglecting to properly feed a begonia usually results in it displaying its displeasure by its leaves turning brown around the edges and just basically looking depressed and sick. Inserting the plant food into the soil creates an almost instantaneous turn-around in the health of the plant. Once the begonia begins to flower, it will continue to do so for many months until it is literally covered in blossoms. Eventually each blossom will turn black and crispy and will look perfectly ugly on the plant. Pinch them off when you spot them and your plant will look much better. Continuing to feed the plant according to the instructions that came with it will enhance the life of the flowering stage of the begonia which will continue for much of the year unassisted anyway. Make sure the plant is not kept in a cold area as begonias like a much more temperate climate. Place the pot in a location that pretty much stays within a certain temperature range year round and don’t let it vary too much in either direction. If the room is unheated in the winter, it is a good idea to move the pot to another room until the warmer weather returns. The plant will remain green and healthy throughout the cold winter months if you follow that simple guideline. 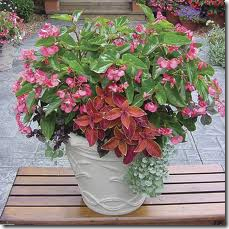 There are many different types of begonia plants. Finding out which kind yours is will assist you in caring for it properly. Find a good plant book or do some research on-line to get the information you need for your particular plant. If you have pets in your home it is probably a good idea to make sure that any houseplants you own are kept in places where your pets cannot chew on the leaves as some plants are extremely toxic.